After years of inflation following the October Revolution the newly formed government, The Union of Soviet Socialist Republics, in late 1923 placed their monetary system on a gold standard. 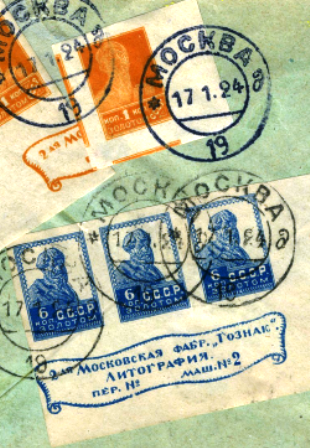 In August new postal rates were established. It would take an additional two months before new postage was issued. On October 11,1923 new Soviet postage stamps in gold currency appear in circulation, the first definitive stamp issue of the U.S.S.R. or The Gold Standard Set. Although this definitive set consists of eleven separate issues this exhibit is concerned with the first nine issues and the eleventh which comprise all the stamps known as the "small heads". The exhibit chronologically follows the development of these adhesives from their introduction in 1923 thru 1928. Changes in the method of printing, paper, watermark and perforation are illustrated along with an assortment of varieties. Only the basic designs remained unchanged. Essays, proofs and specimens along with issued mint and used stamps are interwoven into a fabric which illustrates the evolution of this series. Throughout the exhibit covers, both commercial and philatelic, demonstrate the postal usage of this series and give a glimpse of Soviet life as well as some objectives of the new emerging government. A point of interest is the association of these stamps and their usage with a group of advertising labels issued during the same period and used exclusively in conjunction with this definitive set. The exhibit ends with an introduction to these advertising labels. This exhibit is divided into eleven sections of which the first ten correspond to the first nine issues and the eleventh issue of the Gold Standard Set. One additional section demonstrates the variety and usage of those advertising labels which are so closely associated with the "small heads".